10% Student Discount at Under Armour Get big savings at Under Armour with your Student Beans ID! Under Armour started life in 1996 when a former college football captain developed a t-shirt: “the shorty”. Soft, skin-tight and seriously wicking of sweat, Prototype 0037 - it came to be known - made waves. With the invention of UA Tech in 2005, Under Armour really took things to the next level. Made to feel like cotton, but a heck of a lot stronger, it really changed the game in sports fabrics. 2011 brought Charged Cotton, a mixture of hydrophobic and hydrophilic fibres that absorb sweat from your skin before moving it to the surface of the fabric where it can evaporate faster. With a whole bunch of other innovations (Coldgear, Heatgear, Storm and Gore Tex to name a few) Under Armour has become one of the most hard-working, innovative brands in performance apparel, and it’s not going anywhere. 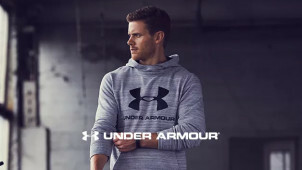 Covering a range of sports clothing, footwear, and casualwear, Under Armour is outfitting a whole generation dedicated to being the best it can be. How do I use my Under Armour promo code? The Under Armour outlet is a great place to make savings on some of their best items! Is there an Under Armour near me? Very probably, check their store finder. Does Under Armour have a size guide? Can Under Armour personalise their products? Not currently. They recommend consulting a qualified screen printer and their FAQs here. Can I get a student discount with Under Armour? Yes, validate your student status here to get a great discount. Can I get free delivery with Under Armour? Absolutely, free delivery is available on every order! Shipping is currently free for all Under Armour products! If you are not 100% satisfied with an item, you can return it for free within 30 days of having received your order. After 30 days, you will no longer be able to return your order. Make sure to include the return packing slip. If you have received a defective item, please contact Under Armour for further support on 00800-82766871. If you bought from a store please only return your item to the store it was bought from. Full returns policy here. You like your exercise and you like to push yourself, but you need clothing to match your ambition. That’s where Under Armour comes in. They make a range of performance clothing that won’t let you down when you need it most, so now everyone can train harder and better than ever. An Under Armour discount code from vouchercloud could cut the cost of your workout gear. Whether it’s footwear, gym t-shirts, sports bras or leggings, Under Armour guarantees high quality at great prices. If you’ve taken up a new sport but don’t know what kit you need, Under Armour will find you the right stuff. Just pick your sport and gender and Under Armour will show you a list of top quality sportwear that fits the bill. Are you a bloke taking up basketball? You’ll get a list of shoes, tops and bags. Woman taking up running? Under Armour will search out the right footwear, leggings and tops. Under Armour’s hoodies are some of the most versatile out there. Whether you’re looking for something loose and comfortable as you shoot some hoops, or something strong and light to keep you warm for your outdoor adventuring, Under Armour has a huge hoodie selection for every activity. An Under Armour promo code could wipe the pounds off your next purchase and, with their different fabric technologies, Under Armour have you covered for any scenario. Keep going mile after mile, shot after shot and lift after lift this year with the Under Armour hoodies.